A mixed-used commercial development has been proposed for the airspace above Melbourne’s railway lines. 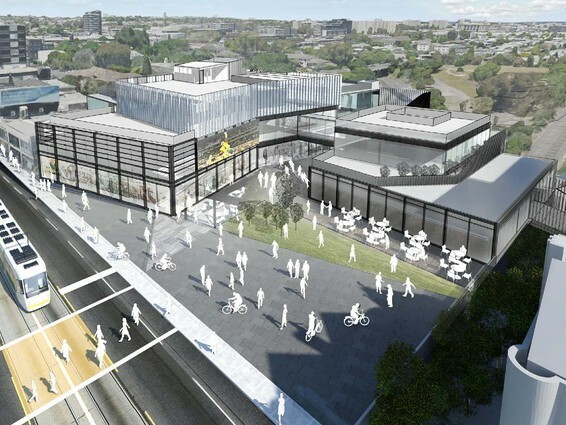 The aerial development would see the space above South Yarra railway station utilised for the creation of two buildings: a four-storey office and retail development, and a smaller two-storey building containing more retail space and a restaurant. The proposal was lodged with the City of Stonnington by Bruce Henderson Architects, who would both design and develop the project at 166 Toorak Road. Plans for the development additionally propose an upgrade of the Toorak Road tram stop, which sits adjacent to the railway station, and the construction of a covered walkway to connect the two new mixed-use buildings. The airspace over Victoria’s railway lines is currently owned by VicTrack. Preliminary consent has already been granted to the Bruce Henderson Architects project by VicTrack development manager, Mike Stasiuk, who attached a letter on behalf of the organisation approving use of the aerial “site”. This isn’t the first bid for the aerial space above Melbourne’s transport network. In March, a proposal was jointly lodged by JCB Architects, Aspect Studios and SJB Planning for a 20-storey residential tower to sit over the Windsor station rail corridor in Melbourne’s inner-south. If approved, the Bruce Henderson-developed project would require the transmission of the space over the South Yarra station from public to private hands – one of the reasons that similar proposals in the past have attracted controversy. It’s unclear when the City of Stonnington council will reveal their decision regarding the 166 Toorak Road proposal.